Diana Smalley's father was helping a friend fix a grain elevator when a belt snapped and hit him in the face. He was rushed to what is now called Fremont (Neb.) Medical Center, where Smalley, who was 3 at the time, visited him regularly during his treatment. Her father needed help eating through a straw while the broken bones in his face mended. The nurse caring for him paid close attention to his recovery, but never forgot that Smalley was there, occasionally bringing her a cup of orange juice, and reassuring her mother that everything would be OK.
Smalley is now the regional president of Mercy in Oklahoma, where she oversees 15 hospitals and more than 100 care facilities in the Oklahoma region. The American College of Healthcare Executives recently honored her with its Gold Medal Award, which identifies ACHE fellows who best exemplify leadership at the organizational, local, state and national levels while improving healthcare services and community health beyond their organization. Smalley's career path changed during nursing school at Nebraska Methodist School of Nursing in Omaha, where she developed a knack for management while supervising a team of caregivers. She went on to earn a master's degree in public health at the University of Minnesota and serve as chief operating officer and CEO at Midlands Community Hospital in Papillion, Neb. She also held senior leadership roles at Alegent Health (today CHI Health), where she co-founded Avantas, which helps healthcare organizations develop workforce strategies. 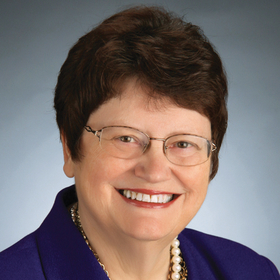 She ended up joining Missouri-based Mercy in 2007 as president and CEO of services and hospitals in Oklahoma. One of her guiding beliefs is that using less acute care is the only way to reduce costs in U.S. healthcare. To that end, Mercy allowed her to build an 80,000-square-foot physician practice center in Oklahoma that's integrated with wellness and sports medicine. “I see that as a model for the future, keeping people well rather than treating them when they're sick,” Smalley said. In one case, a man kept coming to the emergency department because he had trouble breathing. One of the nurses overheard him saying that he was so uncomfortable lying flat to sleep, but didn't have enough money for an adjustable bed. Mercy paid for a reclining bed and his number of ED appearances dropped dramatically, Smalley said. “That is a pretty simple example of how we need to look beyond the current episode of care to keep people out of the hospital,” she said.